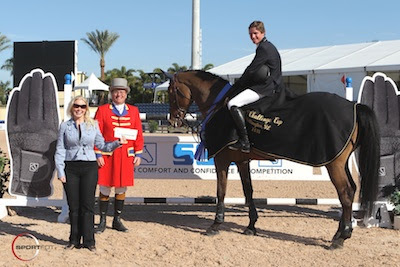 Darragh Kenny and Gael Force won the $31,000 WEF Challenge Cup Round 3 at the 2011 FTI Winter Equestrian Festival. Photo © Sportfot, Official Sport Photographer of the FTI Winter Equestrian Festival, www.sportfot.com. 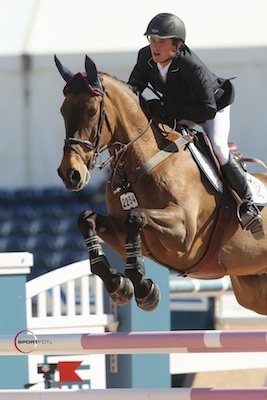 Wellington, FL - January 27, 2011 - Irish rider Darragh Kenny and Gael Force, owned by Missy Clark and North Run, earned top honors in round three of the $31,000 WEF Challenge Cup on Thursday afternoon at the 2011 FTI Winter Equestrian Festival. Sponsored by Nespresso, the WEF is in its third of 12 weeks of competition at the beautiful Palm Beach International Equestrian Center (PBIEC). The circuit will continue through April 3, 2011. Olaf Petersen, Sr. of Germany is designing the courses in the International Arena for week three and set a great course for the afternoon's competition. Eight of the original 42 horse and rider combinations jumped clear to advance to the jump-off round. Today's victory marked Darragh Kenny's first grand prix win at the FTI Winter Equestrian Festival. The young rider, who recently turned 23 years old, was very pleased with the class and praised Gael Force on his consistency. Gael Force is a 13-year-old Irish Sport Horse gelding by Cavalier Royale x King of Diamonds. "The horse jumped great; he jumped both rounds fantastic and he has always been a great horse for me," Kenny said. "It was a good track and I knew Brianne was really fast. I knew that there was really no way that I could catch her other than to do my crazy five strides down the last line. It worked out for me at the time, but it was lucky." "He has had a lot of really good results," Kenny continued. "From day one when I started working for Missy full time he won a grand prix with me in Saratoga the first week that I was there. That was a nice start and it has been nice to have him." 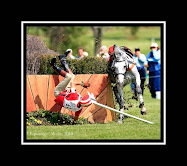 Commenting on the course, Kenny added, "The first round course was not super for my horse even though he jumped great. There were a lot of short distances and he is a little bit on the strong side, but when he got there in a difficult spot he jumped even better, which was great. He was in fantastic form." Kenny and Gael Force will compete in the $40,000 Surpass CSI 2* Grand Prix this Saturday evening and then have their sights set on the $75,000 FEI Nations Cup CSIO 4* presented by G&C Farm during week eight. "I am lucky that I have great people behind me," Kenny concluded, "like Missy [Clark] and John [Brennan] and North Run. The whole barn does a great job. They work really hard and we all work really well together so we are lucky to get good results out of it." In addition to earning the top prize in today's WEF Challenge Cup, Kenny was also presented with a $3,000 bonus for riding in his SSG Gloves during the class. 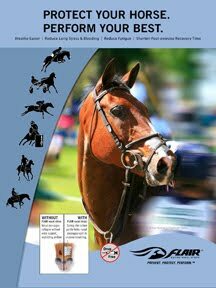 The 2011 FTI Winter Equestrian Festival will continue tomorrow with the Spy Coast Farm 1.40m Speed Challenge, held in the International Arena. For full results please visit www.showgroundslive.com and for more information please visit www.equestriansport.com.